1. Quality Design,Each key is made of sturdy,quality metal alloy and has an antiqued color finish to give them a beautiful vintage look. 2. Give Your Guests A Memorable Gift: These skeleton-key bottle-openers are ones your family and friends will love. 3. Customize for Each Guest: Use the blank gift tags (measuring: 9x4.3cm / 3.5 x 1.75 inches) to write in your guests' names so they can even double as name cards for the dinner tables. Or you can get creative by buying a stamp with the newlyweds' names + wedding date and stamping each one! 4. Get Everything at Once: this 60 pieces set allows you to get everything you need at once for a reasonable price, Rather than buying your favors piece by piece or dozen by dozen. 5. Great All-In-One Party-Favor: Includes a matching number of kraft tags as well as Stainless steel chains for you to assemble your keys and tags into the perfect decorations and favors for your event! 5. 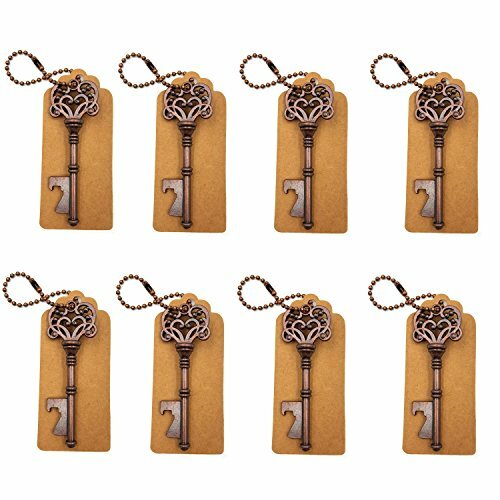 Add extra charm to your wedding by gifting these gorgeous skeleton keys that are actually bottle openers! If you have any questions about this product by DerBlue, contact us by completing and submitting the form below. If you are looking for a specif part number, please include it with your message.